Why darker days may be leaving you SAD ... and what do about it. Now that the clocks have fallen back, and the sun has already begun to set even earlier, we feel that winter dread begin to creep up. Soon enough we will be unpacking winter coats from storage and leaving work in the pitch black (is it 6 p.m. or midnight?!). While many of us will experience a dip in our mood in the coming months, some will be hit harder than others. It was January in New York, roughly five years ago, when my mental health took a nosedive. I'd been managing clinical depression and acute anxiety for years, treating them with both medication and therapy. But suddenly these methods seemed to be losing effect, and my symptoms were starting to impact my performance at work. As a reporter for a financial newspaper on Wall Street, I was required to be in the office at 7:45 a.m. I'd never been a morning person, but now it was all but impossible to get out of bed no matter how well I'd slept. Most mornings I barely made it to the office and I struggled to last the day. When I explained this depression and anxiety flare-up to my therapist, she asked me whether I had a history of feeling worse during the winter. I scoffed, resisted the urge to cry out, "I have depression. My malady thrives in all seasons!" I said no without even thinking about it. A few days later I was in my PCP’s office following up on my therapist's recommendation to increase my antidepressant dosage. 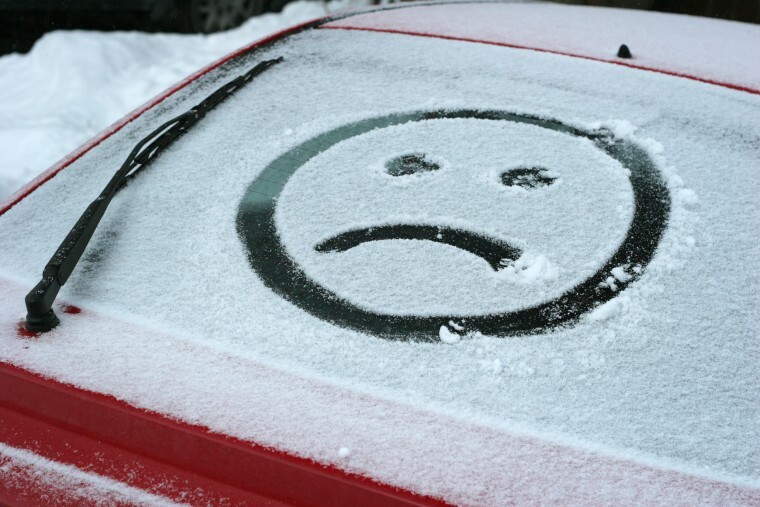 This doctor, too, wondered if perhaps Seasonal Affective Disorder (SAD) was at work. Really? More talk about the weather? I was annoyed. SAD symptoms include not only depression, but changes in appetite, weight gain, irritability, anxiety, sleep abnormalities, muscle aches and difficulty concentrating. As much as I didn't want to hear it at the time, I now think both doctors were on to something and I wish I'd had more patience with them. Knowing more about SAD, I think I probably did have it — in addition to the depression and anxiety I was already treating. Browsing through outgoing emails and journal entries from years past, it's evident that when I lived in New York I felt markedly worse in the winter months, but would improve in spring, a telltale sign of SAD. Now I live in Los Angeles where the winters are short and mild and sunshine is always abundant. I don’t feel any worse in February than I do in June, which further compels me to think I had SAD. To learn more about the condition, I talked with people who have been diagnosed with SAD and are prepping to combat it as the days start to shorten. I also talked with doctors who study it including Dr. Norman Rosenthal, MD, clinical professor of psychiatry at the Georgetown University School Of Medicine and the author of the book "Winter Blues: Seasonal Affective Disorder: What It Is and How to Overcome It." A SAD sufferer himself, Rosenthal was the first to formally describe the disease and give it a name (yes, he appreciates the "neat acronym," as he calls it). This was back in the early 1980s when he was working at the National Institute of Mental Health. "Roughly five percent of the country has it, with another 10 to 15 percent having a milder variation of SAD," says Dr. Rosenthal, adding that SAD symptoms include not only depression (this usually manifests as a later symptom, he adds), but changes in appetite and cravings, weight gain, irritability, anxiety, sleep abnormalities, muscle aches and difficulty concentrating among other symptoms. SAD runs on a spectrum, so it works a bit differently in everyone. "The most severe cases will see people feeling completely incapacitated," says Dr. Meir Kryger, MD, professor of Medicine at Yale School of Medicine, highlighting that SAD is never just "a matter of being bummed out, but something that interferes with your ability to function." Sufferers experience a pronounced decline in the late fall and winter months, and start to bounce back in spring. Jessica Krom, a 35-year-old single mom with a full-time job based in Owego, New York, can certainly relate to this. She was diagnosed with SAD four years ago, and on days when she's "full blown" is virtually unable to do anything. John McCarthy, a 46-year-old library aide in Albany, New York, says he gets all over body aches, similar to what you'd feel with the flu, "but it last for months." SAD also affects his ability to communicate. "Words are fast in my head but slow coming out when I talk; it’s hard to follow a conversation because I can’t track the words fast enough," McCarthy says, adding that no matter how much he sleeps he is tired, is easily irritated and overwhelmed, can't concentrate, and feels lonely, sad, afraid and anxious. With so many symptoms that can point to so many different causes, SAD can be tricky to diagnose, but there is at least one defining aspects in every case of SAD, and it’s right there in the name: seasonal. Sufferers experience a pronounced decline in the late fall and winter months, and start to bounce back in spring. Research is still being fielded to discover exactly what causes SAD, but Rosenthal notes that the most compelling data points to the connection between natural light and the brain’s production of serotonin. “[There is] evidence that serotonin concentration in critical brain regions declines during the winter, and that bright environmental light is associated with higher brain serotonin concentration,” says Rosenthal. But why do some people suffer acutely and others not at all? Why are women four times more likely than men to develop SAD? Why are vegetarians, as Kryger points out, between three and four times more likely to have it? These aren’t questions for which we yet have concrete answers. “There is a lot of emerging science that we don’t quite understand yet,” notes Kryger. SAD may still be in some ways mysterious, with no known cure, but there are ways to manage it. Once diagnosed, you’ll likely want to invest in a light therapy box. “Light therapy is the primary treatment,” says Rosenthal, adding that when it comes to choosing a light box (you can buy one on Amazon) you should choose a larger one, where the surface area through which the light is emitted is at least one foot square. You should also pick fluorescent over LED, and white over blue light. The worst thing you can do is stay indoors and not be exposed to natural sunlight at all. Certainly you must talk with your doctor before doing any of this, but generally people with SAD will want to spend at least 15 minutes a day practicing light therapy. As for time of day, some people will respond best first thing in the morning, while others will benefit more in the evening. You’ll have to figure what works best for you, but in any case, don’t ever opt for the light box over natural light. “The worst thing you can do is stay indoors and not be exposed to natural sunlight at all,” says Kryger, who also recommends doing your workouts outside in the early morning light if possible. If you can’t get outside, Rosenthal recommends exercising in front of the light box. While light therapy has been proven to work, some people with SAD may require more. SAD sufferer Bright uses a light box for 40 minutes a day, but also takes antidepressants, vitamin D and magnesium citrate. McCarthy uses a light box (it gives him a burst of energy), but also takes vitamin D and Lexapro and practices mindfulness exercises and takes long runs. Krom takes antidepressants along with vitamin D, adding that she also has a severe Vitamin D deficiency. (Note that if you’re thinking of adding a supplement, you should first get tested to see if you have a deficiency). SAD sufferers may also want to try cognitive behavioral therapy, which has been shown to help. But of course, before you can begin to treat a malady, you need to know you have it, and before that, you need to first be open to the diagnosis. I certainly wasn’t open to this diagnosis at the time it was suggested to me, and I now realize that this attitude didn’t only hurt me, it fed into a stigma that SAD sufferers are up against all the time: that their illness is merely a self-important aggrandizement of the winter blues that everybody feels, or, what’s worse: they’re failing to simply get a grip. In addition to their medical treatments, SAD sufferers should seek out a support group. Bright, McCarthy and Krom all belong to the Facebook group “Seasonal Affective Disorder SAD, Winter Depression, Winter Blues”, which they each find to be helpful.